Kelly Merritt (center) talks with her daughters Madilyn (left) and Melanie about Girls on the Run. Kelly Merritt is a former coach with the organization. Madilyn is a former participant. Girls on the Run is an after-school program that meets twice a week. There is running, as the name implies. But, it also creates safe space for girls to open up about tough issues. 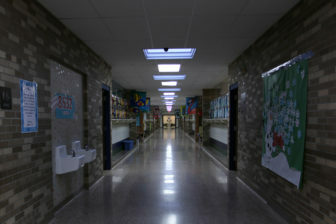 An Alaiedon Elementary hallway. When weather was bad they would run in the hallways of the school. When Kelly Merritt first heard about Girls on the Run, she thought, “Oh, it’s a bunch of little kids and we can all run together and do a 5k at the end. That’s really awesome,” she said. 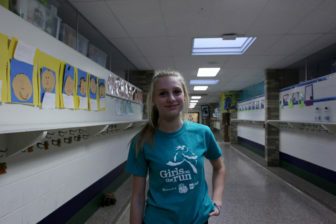 As she began coaching a GOTR program at Alaiedon Elementary, she realized how “completely priceless” the curriculum is. girls by giving them the tools to support one another, a common language and their own voice. Barb Byrum and Gina Krahulik are leaders. Byrum is the Ingham County clerk and board secretary of Girls on the Run Mid Michigan. She’s also a former state representative. 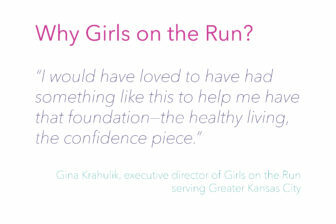 Krahulik is the executive director of Girls on the Run serving Greater Kansas City. It’s her job to lead “the strategic vision of the organization,” she said. Both understand the power of girls having the confidence to speak up and communicate effectively in today’s fast-moving social climate. Especially one that includes bullying, #MeToo movements and women’s marches. GOTR isn’t about competition or being the best at running. It’s about being physically active, setting goals and the valuable work along the way. The GOTR program has three phases, Krahulik said. “The last component is this global citizenship. So—how do you give back to your community? How do you show gratitude—express gratitude?” Krahulik asked. Kelly Merritt is a former GOTR coach and said her daughters, Madilyn and Melanie, went through the program at Alaiedon Elementary. After her older daughter had experience with the program, she said Madilyn would recall experiences older teammates dealt with. Madilyn told her, “This fifth-grader dealt with bullying and I remember she told us the story and this was how she dealt with it,” Merritt said. The girls would talk about what worked and what didn’t, she said. It’s a better perspective coming from someone closer to their age, “versus ‘Oh this is what my mom told me’,” Merritt said. Madilyn is now an eighth-grader at Mason. She said she still uses what she learned in GOTR. Madilyn said she is a shy person and some of the more serious games at practice were uncomfortable. Discussing issues like peer pressure was difficult, she said. But talking through scenarios with her teammates opened her eyes and helped her see those things could actually happen to her, she said. “Now those things have happened to me—being older—and I think those games have helped me a lot because I know what I’m supposed to say now. They educated me on everything,” she said. Melanie Merritt (right) talks to her mom and sister about her experience in Girls on the Run. “Now I know how to say and what to say,” she said. Madilyn has also made lasting friendships with teammates from the program and said they still use GOTR language when they hit rough patches with friends.